Just outside of Killington, there’s a beautiful town called Burlington, where you’ll find a picturesque lake that isn’t just pretty – it’s also home to some of the world’s oldest coral reefs, as well as hundreds of species of fish and plants. To get to know more about this fascinating ecosystem, visit ECHO, Leahy Center for Lake Champlain. Here, you’ll enjoy hands-on exhibitions, and you may even solve the lake’s biggest mystery … is Champ the Lake Monster real? And it’s fun, he says. (We’ve been there, and we agree.) ECHO staff goes above and beyond to bring guests exciting programs, hands-on science, animal feedings and demonstrations – and so much more. ECHO was founded in 1995 as the Lake Champlain Basin Science Center, gaining its current moniker when the new facility was built in 2003. A little-known fact, ECHO doesn’t only sound cool – it’s actually an acronym standing for Ecology, Culture, History and Opportunity for stewardship of the basin. Open year-round, with the exception of Thanksgiving, Christmas Eve and Day, you can view 70-plus species of live animals at ECHO, which happens to be Perkins’ favorite ‘perk’ of the job. Who knew there were so many types of frogs, or that the American Bull Frog is so huge?! Permanent exhibits include an Action Lab, Frog World, Before the Basin, Discovery Place, Voices for the Lake, Indigenous Expressions, Lake Champlain Navy Memorial and more. View a full list on the ECHO website. Watch scientists at work in a research lab, check out the gift shop and grab a bite at the waterfront restaurant. While we can’t promise a sighting of Champ the Mythical Lake Monster, you can take a picture with the giant “Recycle-a-Saurus” at the front door, composed entirely of plastic bottles. “We believe one drop is all it takes to make a difference in the overall ripple effect toward positive change in our world, and encourage everyone to do their part,” Perkins says. You can do your part by visiting the center, for an admission fee of only $14. 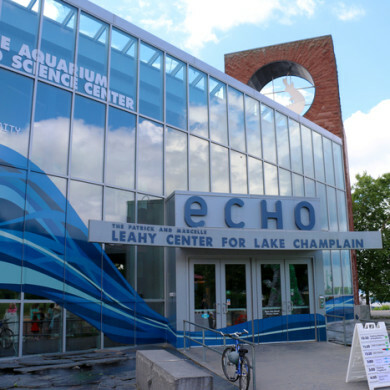 ECHO, Leahy Center for Lake Champlain, is located at 1 College Street in Burlington, VT. For more information, visit the ECHO website or call (802) 864-1848.